SJUSD has four students headed to out-of-state colleges next fall to play volleyball, a record number of volleyball athletic scholarships for the district. All four seniors are at San Jacinto High School, where their coaching staff held a ceremony signing of “Letters of Intent” to commit to a college on Tuesday, January 22, in front of family, faculty and friends. 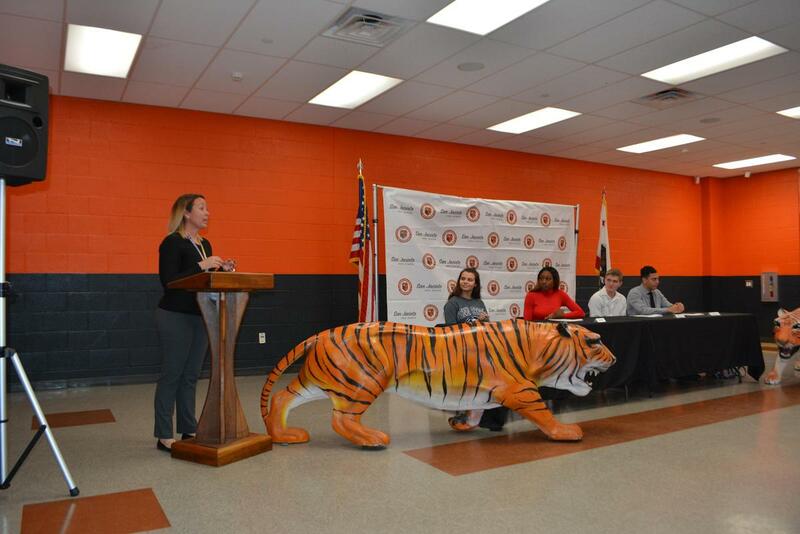 “It’s always the hope and desire of the Athletic Department here at SJHS to not only see our students further their education after graduation, but to also further their athletic careers as well,” said Amanda Galliano, SJHS’s Athletic Director. “It is with a tremendous amount of pride that we get to do just that today for not just one, but four athletes within our volleyball programs,” she noted. 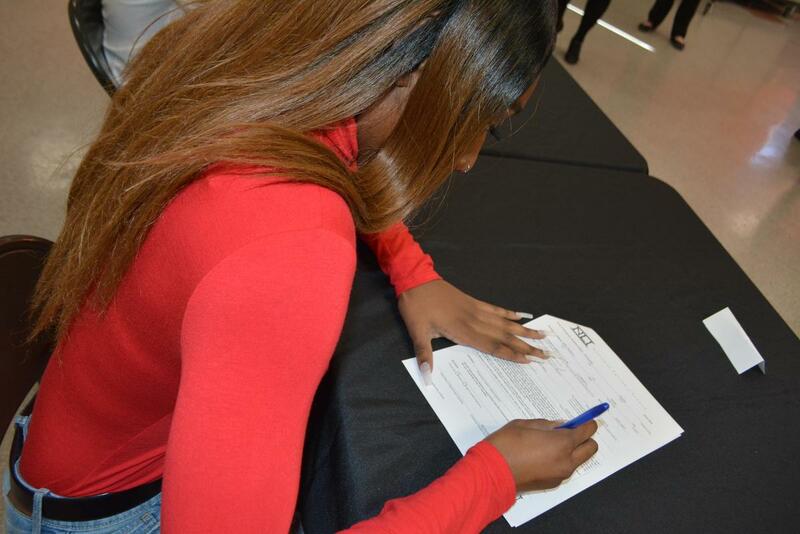 Angelina Alpirez signed her intent letter for Penn State Greater Allegheny, located in McKeesport, Pennsylvania for women’s volleyball. Dejah Outland made her commitment for Lane College women’s volleyball program, where the school is located in Jackson, Tennessee. Both (Sheaden) Michael Cox and Jhourdan Woods signed letters of intent for the men’s volleyball program at William Penn University, located in Oskaloosa, Iowa. 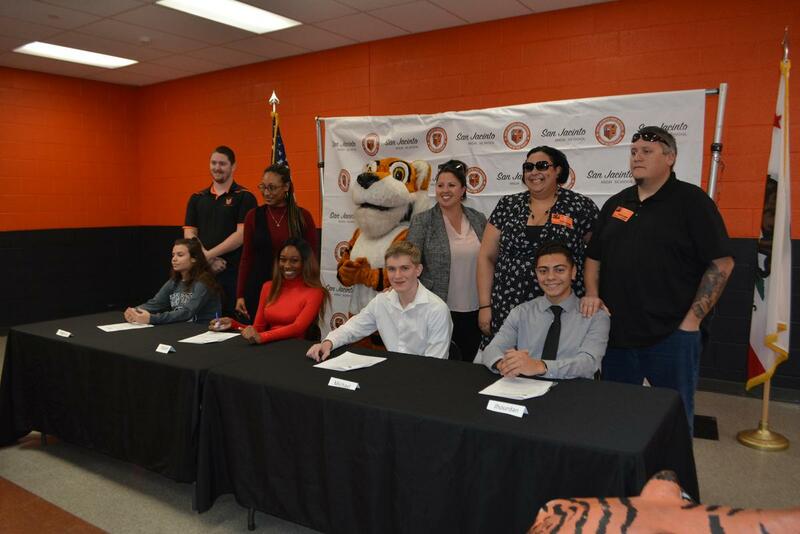 Before signing their individual letters, Coach Cory Sumrall introduced the students, noting they were the most dedicated of athletes and expressed appreciation that volleyball is available as a collegiate sport. Each athlete shared their appreciation of others that helped them on their journey to a scholarship, what they hope to achieve in college and any words of advice to their fellow students. “I’m glad I never gave up,” said Dejah Outland, “but Coach had to help me stay focused on drills and I’m glad my mom came and supported me.” Angelina Alpirez said high school volleyball helped her learn what it means to have patience. “It’s a game of mistakes and you learn to improve based on them,” she explained. “I gained a lot in volleyball,” shared Michael. “I learned about team and gained a second family,” he said sincerely. Jhordan Woods said that volleyball helped him with focus. “My advice is to work hard and stay up with your school work, and take advantage of extra practice,” he noted. Jhordan’s mother, Kimberly Bober, is very proud of her son and excited for him as he will be the first university student in the family on her mother’s side. “He also has a passion for robotics, which he began in middle school at the Leadership Academy,” said Mrs. Bober. It’s been a few years since any SJHS volleyball players have been recruited for college, and never before a year with four. In 2010, Holli Dougan was recruited for Dominican University of California, in 2013, Breanna Laughlin was recruited for St. Michael’s College in Vermont. Most recent was the 2016 recruitment of James Thompson-Coleman, for Briar Cliff University in Sioux City, Iowa.